There are several progressive jackpot games within the BetSoft Slots3 collection of 3D pokies, but none have the potential to be quite as rewarding as Mega Glam Life, the revamped sister game to the original Glam Life progressive. Spin the glittery reels of this wealth-studded game for your chance to strike it rich from the comfort of home. Slots Million – More slots than any other casino site, with over 1,800 instant-play games to choose from, from over 30 of the world’s best software developers. House of Jack – an impressive multi-provider browser based casino that houses the entire collection of BetSoft 3D pokies along with slots from Microgaming, Play’n Go and Quickspin. These trustworthy casinos are all licensed by reputable gambling jurisdictions and protected by a minimum of 128 Bit SSL (Secure Socket Layer) encryption technology to ensure safe gaming. Instant deposits are available using a range of trusted online payment methods. 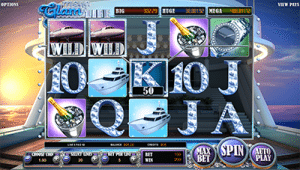 Mega Glam Life is a five-reel, three row, 3D pokies game with 20 pay lines, featuring a wild symbol, scatter symbol and bonus symbol. To play, you need to select your coin size, bet size and the number of paylines you wish to activate. Coin sizes available are 0.02, 0.05. 0.10, 0.25. 0.50 and 1.00, with a minimum bet of $0.02 and a maximum bet of $100. A max bet button is available for convenience, while an auto-play feature allows the computer to play up to 100 automatic spins on your behalf. Wild symbol – the wild symbol is the private jet, which can appear on any reel during the base game, free spins and re-spins. The wild can substitute for any other symbol to form a winning combination, bar the scatter and bonus symbols. Landing three or more wilds on the reels triggers a bonus re-spin, where all wilds are held in place on the reels for the chance for bigger wins. Money Wheel progressive jackpot – this is the big daddy of the bonus features and what we’re all really chasing after. The Money Wheel is triggered by three or more bonus symbols appearing anywhere on reels three, four and five, and will take you to a wheel-of-fortune style bonus game which holds a bunch of cash prizes, including the three-tiered progressive jackpot. Land on the Big Jackpot, Huge Jackpot or Mega Jackpot for a win you’ll never forget, with jackpots soaring into the hundreds of thousands. As far as BetSoft’s highly impressive, unique range of 3D pokies go, Mega Glam Life is amongst the least creative, but that doesn’t mean it’s not a great game. While the symbols and game layout may not be as inventive as others we’ve seen from BetSoft software, the real draw card here is the progressive jackpot, which certainly doesn’t disappoint. Compared to older progressive jackpot pokies like Mega Moolah and Arabian Nights, Mega Glam Life rules the progressive world, and is well worth your time and money to experience vibrant gameplay and the potential to strike it rich.